Sports bars in particular must invest in keeping up with video wall trends and other configurations to attract new customers and keep the regulars coming. 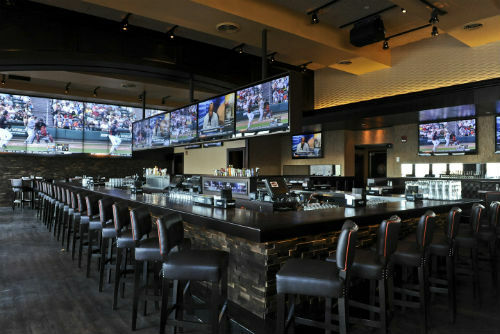 In order to accomplish this, and to create an inviting atmosphere, sports bars are increasingly installing systems that combine large video walls with auxiliary monitors located throughout the bar. The utilization of a large, centralized matrix switching solutions feeding a varying number of smaller environment matrix switchers is a great solution for allowing complete coverage in getting source content to any destination with a facility. Restaurants and hospitality venues also require custom designed security systems that include CCTV monitoring: registers, safes, inventory, retail products, premises', and parking lots. Whatever the needs of your commercial property or business, Synergy has the knowledge and understanding to help securing and monitoring your business.